Some materials are prone to sticking to itself clustering and forming bulks of materials that stick to the interior of the vessel. This process is usually called simply caking. There are various factors that may cause this, but in the vast majority of cases the only reason is physical properties of the material. In order to counteract caking, you can use a wide array of tools and methods customizing your drying equipment to make it “cake-resistant”. Back mixing. Simply blending together dried and moist material can be a straightforward solution to the problem of caking. Obviously, reducing average wetness of the material reduces its adhesion, but this does not work with many materials that will remain sticky regardless of the level of moisture contents. Altering lifters. Making some sections of the vessel lifterless is generally a good idea. This allows material to lose as much wetness as possible before meeting the flights. Another elegant solution is to have flights with rounder corners that will prevent clumping from happening. There are various ways to reduce caking or prevent it from happening altogether. Strommashina can manufacture any combination of installments and additions for a rotary dryer in order to help you in fighting with the issue of caking. Knocking systems. This is most common and simplest method of preventing caking. Anti-accretion system will remove clumps from the walls of the vessel by constantly hammering the exterior. We prefer to mount knocking hammers closer to the inlet to prevent the material from sticking to itself and the vessel. Material near the inlet has the most moisture content. Knocking system is a specific exterior extension for a rotary dryer that serves a purpose of counteracting accretion. Build-up inside the vessel can negatively affect the drying process and it is imperative to remove build-up as fast as possible. Accretion happens when the material clumps and sticks to the walls of vessel. Small bits of material attract flowing particles and worsen accretion quickly. In order to counter accretion, knocking systems hammering the shell and remove clumps through vibration. Knocking occurs simultaneously with rotating. 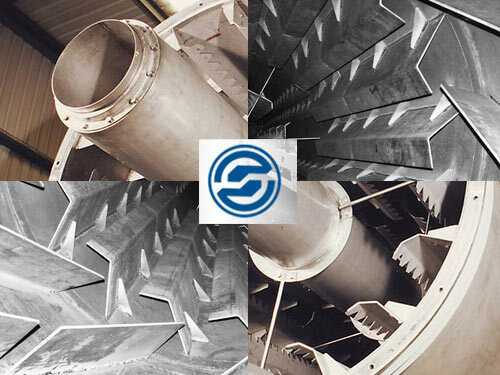 There are various knocking systems that can be added to a rotary drum dryer. Strommashina produces all types of knocking systems including pneumatic systems, hammers, ramps, etc. Such systems can be added to new equipment if necessary or mounted on existing machines. If you need such systems, feel free to contact us and receive all information about them!